Hypocalcemia; Infant, Newborn; Subcutaneous Fat Necrosis; Perinatal Stress. Some predisposing factors have been identified in the literature. These include hypoxemia, hypothermia, rhesus incompatibility, birth asphyxia, meconium aspiration syndrome, hypoglycemia, obstetric trauma and some maternal conditions such as preeclampsia, diabetes mellitus, cocaine abuse, and use of calcium channel blockers during pregnancy.3,11 The best-recognized risk factors for the development of SCFNN are perinatal asphyxia and therapeutic hypothermia.7 Race and gender do not play a role.4 In 2006, Karochristou et al,2 reported the first case of SCFNN associated with hypocalcemia in a Greek neonate who suffered perinatal asphyxia. In 2014, of four cases of SCFNN reported by Jianping and Ye,6 three had hypocalcemia. Several reports indicated that the prevalence of SCFNN is unknown.2,7 Apart from these two reports,2,6 an extensive search of the literature did not reveal any other reports of hypocalcemia associated with SCFNN following perinatal asphyxia. Here, we report a case of a neonate with subcutaneous fat necrosis who surprisingly developed hypocalcemia instead of hypercalcemia. A full-term female neonate was admitted to the Special Care Baby Unit of St Philomena Catholic Hospital, Benin City, Nigeria, following delivery by emergency cesarean section for fetal distress. The mother’s pregnancy was uncomplicated up to delivery, and there was no history of maternal cocaine abuse. Her anthropometric measurements were birth weight 4.1 kg (95th percentile), length 50 cm (50th percentile), and head circumference 34.5 cm (50th percentile). The Apgar scores were 3, 4, and 8 at 1, 5, 10 minutes, respectively. The infant did not have any dysmorphic features, and she was tube-fed breast milk only. On the seventh day of life, the infant was found to have multiple nodules and these were located in the neck, upper back, and right arm. The nodules were firm, well-circumscribed, nonsuppurative, mobile subcutaneous masses, and their diameters ranged from 1-2 cm to 2-3 cm. One of the subcutaneous nodules in the cervical region is shown in Figure 1. 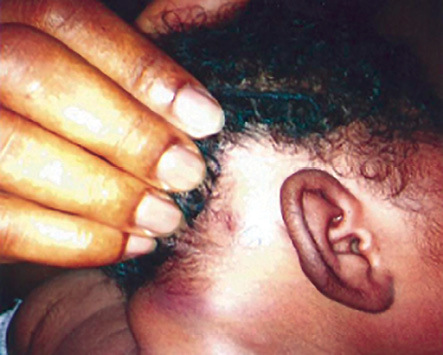 Figure 1: A subcutaneous nodule in the neck region of a seven-day-old neonate. Her total serum calcium level was 1.55 mmol/L (normal range 2.2 to 2.7 mmol/L),11 and this was associated with hypotonia and a poor sucking reflex. Her packed cell volume was 40%. The serum albumin and blood glucose levels were within normal limits. Blood culture was sterile. A clinical diagnosis of hypocalcemia associated with SCFNN was made. The infant was treated for hypocalcemia using calcium gluconate and was discharged home after normalization of the serum calcium level. The infant was carefully followed-up. The skin lesions resolved completely three months after their eruption. Repeat serum calcium measurements at three, six, and nine months of age were all within normal limits. Some predisposing factors that may have played a role in the development of SCFNN in our patient need to be considered. These include perinatal asphyxia and fetal macrosomia. The development of SCFNN in our patient is most likely related to perinatal asphyxia. This view is supported by a case series involving 11 patients where it was found that perinatal asphyxia was the most frequently encountered predisposing factor.12 Since subcutaneous fat necrosis does not occur in all neonates with the two predisposing factors found in our patient, additional predisposing factors most likely exist. Unexpectedly, our patient presented with hypocalcemia rather than hypercalcemia. This is surprising, given that in the literature the majority of SCFNN cases were associated with hypercalcemia.4,5,16 However, in 2006, Karochristou et al, 2 reported the first association of SCFNN with hypocalcemia. In China, Jianping and Ye also found hypocalcemia in three out of four neonates with SCFNN.6 They did not provide any explanation for the hypocalcemia. Sclerema neonatorum co-existing with SCFNN has also been reported previously.23 In infants with a history of perinatal stress, the peak age of appearance of the skin lesion is between six and 10 days,2 but a report from Brazil documented the presence of a skin lesion at birth.24 In Lebanon, Mneimneh et al,25 reported a case of a five-day-old infant with subcutaneous fat necrosis without any identifiable predisposing factor. The above reports reflect the wide variations in the clinical manifestations of SCFNN. Thus, suggesting the need for a greater physicians’ alertness to avoid missed diagnosis and, consequently, the morbidity and mortality associated with its complications when untreated. Some of the limitations of this case report need to be considered. We were unable to perform skin biopsy (for histological diagnosis of SCFNN) and measure serum PTH, phosphate, and 1,25-hydroxy vitamin D levels (to define the pathogenesis of the hypocalcemia further). Although these investigations would have further strengthened our diagnosis, other case reports2,5,6,22 based initially on clinical diagnosis (as in our patient) were later confirmed by skin biopsy to be SCFNN. In addition, Singalavanija et al,26 stated that the diagnosis of SCFNN is clinical, but in atypical cases skin biopsy is helpful. Thus, supporting our clinical diagnosis of SCFNN. Although SCFNN is a rare benign clinical condition, it may be complicated by hypocalcemia. Therefore, in keeping with previous recommendations, periodic measurements of the serum calcium levels is warranted beginning from the neonatal period up to the age of six months. Where appropriate, nursing care with frequent changes in position are among the measures that could be implemented to preserve tissue perfusion, thereby decreasing the likelihood of a patient developing SCFNN. 1. Harrison GA, McNee J. An investigation of sclerema neonatorum with special reference to the chemistry of the subcutaneous tissues. Arch Dis Child 1926;1(2):63-84. 2. Karochristou K, Siahanidou T, Kakourou-Tsivitanidou T, Stefanaki K, Mandyla H. Subcutaneous fat necrosis associated with severe hypocalcaemia in a neonate. J Perinatol 2006 Jan;26(1):64-66. 3. Yan AC. Skin conditions in newborns and infants. In: Pride HB, Yan AC, Zaenglein AL, editors. Pediatric Dermatology. Chicago: Saunders Elsevier; 2008. p. 141-156. 4. Hicks MJ, Levy ML, Alexander J, Flaitz CM. Subcutaneous fat necrosis of the newborn and hypercalcemia: case report and review of the literature. Pediatr Dermatol 1993 Sep;10(3):271-276. 5. Al Shidhani KSH, Al Maani AS, Al Jabri ATJ. A rare presentation of a newborn with subcutaneous fat necrosis. Oman Med J 2013;28(4):88-90. 6. Jianping T, Ye S. Subcutaneous fat necrosis of the newborn: Clinical manifestations in four cases. Austin J Dermatol 2014;1(4):1017-1019. 7. Tran JT, Sheth AP. Complications of subcutaneous fat necrosis of the newborn: a case report and review of the literature. Pediatr Dermatol 2003 May-Jun;20(3):257-261. 8. Janssens PM, Vonk J, Demacker PN. Hypertriglyceridaemia in a case of subcutaneous fat necrosis in a newborn. Ann Clin Biochem 1993 Sep;30(Pt 5):482-484. 9. Wolach B, Raas-Rothschild A, Vogel R, Choc L, Metzker A. Subcutaneous fat necrosis with thrombocytopenia in a newborn infant. Dermatologica 1990;181(1):54-55. 10. Norton KI, Som PM, Shugar JM, Rothchild MA, Popper L. Subcutaneous fat necrosis of the newborn: CT findings of head and neck involvement. AJNR Am J Neuroradiol 1997 Mar;18(3):547-550. 11. Ogilvy-Stuart A, Midgley P. Practical neonatal endocrinology. Cambridge: Cambridge University Press; 2006. p. 133-142. 12. Burden AD, Krafchik BR. Subcutaneous fat necrosis of the newborn: a review of 11 cases. Pediatr Dermatol 1999 Sep-Oct;16(5):384-387. 13. Katz DA, Huerter C, Bogard P, Braddock SW. Subcutaneous fat necrosis of the newborn. Arch Dermatol 1984 Nov;120(11):1517-1518. 14. Cote NL, Patterson JE. Panniculitis. In: Fitzpatrick JE, Morelli JG, editors. Dermatology Secrets Plus. 3rd ed. Philadelphia: Mosby; 2007. p. 156-165. 15. Paige DG, Gennery AR, Cant AJ. The neonate. In: Burns T, Breathnach S, Cox N, Griffiths C, editors. Rook’s Textbook of Dermatology. 8th ed. Massachusetts: Blackwell Publishing; 2010. p. 590-592. 16. Vijayakumar M, Prahlad N, Nammalwar BR, Shanmughasundharam R. Subcutaneous fat necrosis with hypercalcemia. Indian Pediatr 2006 Apr;43(4):360-363. 17. Minagawa M, Yasuda T, Kobayashi Y, Niimi H. Transient pseudohypoparathyroidism of the neonate. Eur J Endocrinol 1995 Aug;133(2):151-155. 18. Mimura Y. Phosphate excretion during 24 h of hypoxia in conscious rats. Acta Physiol Scand 1995 Nov;155(3):283-289. 19. Mimura Y. Phosphate and cyclic AMP excretion decreases during less than 12 hours of hypoxia in conscious rats. Acta Physiol Scand 1996 Dec;158(4):317-323. 20. Calisici E, Oncel MY, Degirmencioglu H, Sandal G, Canpolat FE, Erdeve O, et al. A neonate with subcutaneous fat necrosis after passive cooling: does polycythemia have an effect? Case Rep Pediatr 2013;2013:254089. 21. Merlob P, Amir J. Pathogenesis of hypocalcemia in neonatal polycythemia. Med Hypotheses 1989 Sep;30(1):49-50. 22. Oliveira AC, Selores M, Pereira O. Fat necrosis of the newborn–report on two cases. An Bras Dermatol 2011 Jul-Aug;86(4)(Suppl 1):S114-S117. 23. Jardine D, Atherton DJ, Trompeter RS. Sclerema neonatorum and subcutaneous fat necrosis of the newborn in the same infant. Eur J Pediatr 1990 Dec;150(2):125-126. 24. Gomes MP, Porro AM, Enokihara MM, Floriano MC. Subcutaneous fat necrosis of the newborn: clinical manifestations in two cases. An Bras Dermatol 2013 Nov-Dec;88(6)(Suppl 1):154-157. 25. Mneimneh S, El-Rajab O, Rajab M. Subcutaneous fat necrosis of the newborn: case report. Int J Contemp Pediatr 2015;2(2):164-167. 26. Singalavanija S, Limponsanurak W, Wannaprasert T. Subcutaneous fat necrosis of the newborn. J Med Assoc Thai 2007 Jun;90(6):1214-1220.